This is an Exercise Machine that simulates a fight with a real opponent or private session with a boxing coach at any place convenient for you. It is that you hit the ball, it flies from you in either direction or straight depending on which point of the ball you just hit, and then flies back. You need to react immediately to the object flying back to you and again to hit the ball. The stronger you hit the faster the simulator flies back to you. It will be useful to everyone. To beginners and people who just want to lead a more active lifestyle. This Exercise Machine is perfect for office workers who spend a lot of time in work chairs. Only 10-15 minutes 3-4 times a week and this will be enough to keep you in shape. - Fast sportsman's reaction to the target's movements- improvement of general coordination in the space and body endurance, skills of operational orientation. Please keep out of hands of smaller children and do not use next to devices such as electronics or other valuables you have. FOCUS ON DEVELOPING BETTER REFLEXES - Designed on a string, the elastic fight ball comes back to you, challenging you to increase your speed and reaction. Highly visible, the fight boxing reflex ball on the thread will improve your hand-eye coordination. The reflex ball will sharpen your boxing skills. BOXING BALL FOCUSED ON YOUR SAFETY - Made from an optimum combination of nylon and non-allergenic neoprene, the wide jab ball head strap is durable and will last for a long time. 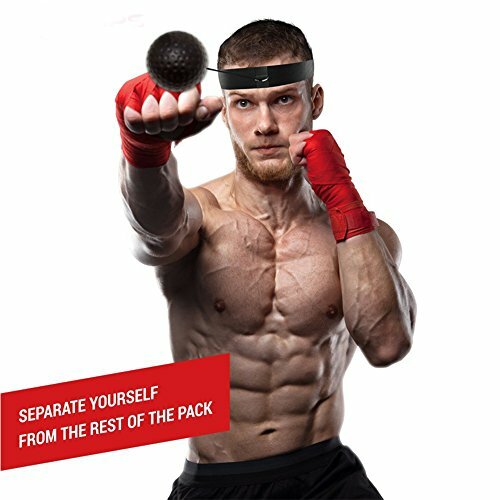 The soft neoprene inner lining of the headband boxing trainer is 100% safe for your skin, preventing chafing or rubbing. The boxing punching ball ensures you remain comfortable during your speed ball training. DON'T MISS YOUR NEXT TRAINING - Suitable for beginners and pros alike, adults and children, the adjustable head strap of the boxing punching ball fits all head sizes. The lightweight, portable boxing head ball is fitted with a durable, elastic cord. With a simple and functional design, pack the boxing reflex bag into its carrying pouch and take your personal boxing trainer wherever you go.